The speech, shown below, was filmed in June. 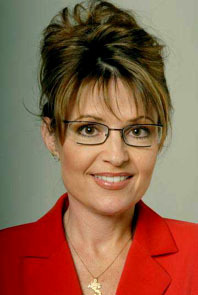 Palin describes the visit of Pastor Thomas Muthee to the Wasilla Assembly of God in 2005. "As I was mayor and Pastor Muthee was here and he was praying over me, and you know how he speaks and he's so bold. And he was praying 'Lord make a way, Lord make a way,'" Palin remarked. “And I'm thinking, this guy’s really bold, he doesn't even know what I'm going to do, he doesn’t know what my plans are," she continued. "And he’s praying not 'oh Lord if it be your will may she become governor,' no, he just prayed for it. He said, 'Lord make a way and let her do this next step. And that’s exactly what happened.'" “So, again, very very powerful, coming from this church,” she added. In 1988, Pastor Muthee and his wife traveled to Kenya after being "called by God." Setting up shop in the basement of a grocery store, they claim to have brought 200 people "to God" and away from the town's "spiritual oppression." The source of the oppression? Witchcraft, Muthee says. When researching the community, they found that a woman named "Mama Jane" ran a divination clinic that drew a large following in the town. “We prayed, we fasted, the Lord showed us a spirit of witchcraft resting over the place,” Pastor Muthee said. Muthee made his experiences into a video called Transformations, which documents his "spiritual warfare" against demons and occult practices. Spiritual warfare is more common in Latin America and Africa, where the concept of day-to-day demons has a stronger hold. The video's trailer is available here. The film -- and Muthee's practices -- received treatment in a 1999 Christian Science Monitor article. "According to accounts of the witchhunt circulated on evangelical websites such as Prayer Links Ministries, after Pastor Muthee declared Mama Jane a witch, the townspeople became suspicious and began to turn on her, demanding that she be stoned," the London Times noted Tuesday. "Public outrage eventually led the police to raid her home, where they fired gunshots, killing a pet python which they believed to be a demon." Palin's speech accompanied the Wasilla Assembly of God's Masters' Commission, which the church's pastor said will allow Alaska to become a refuge for American evangelicals during the coming "end of days" -- or Armageddon.